This article summarizes the crucial steps that operators of DNS servers should take to ensure that their users will not experience any difficulties following the scheduled DNS maintenance at the end of 2018 and early 2019. After these dates, software with outdated configuration will stop working properly. The impact of individual changes is detailed in the relevant chapters below. At the latest by October 10, 2018, operators of recursive servers and other software that performs DNSSEC validation must update the DNSSEC root key (trust anchor) used to validate signatures obtained from the public DNS. On 11 October 2018 at 4:00 PM UTC, for the first time in history, the DNS root zone will be signed with a new key. For this reason, the software missing the new DNSSEC root key in the configuration will not be able to resolve any data using DNS starting October 11, 2018, and from the point of view of a common user, “the Internet will not work”. File naming and location, as well as their exact format, depend on the specific version of the software and the operating system used. That is why we recommend reviewing guides for usual cases on ICANN pages. Turris Omnia users with an updated operating system do not have to be afraid of the transition because the new key has been automatically installed on their devices. Authoritative server operators should ensure that their name server implementation correctly responds to queries with EDNS extensions by January 31, 2019 at the latest. In accordance with the published plan, major DNS software vendors will discontinue support for servers that violate both the DNS standard RFC 6891 and its predecessor RFC 2671 after February 1, 2019 (also for the first time in history). In practice this means that servers that do not respond to queries with EDNS extensions will stop functioning after February 1 for clients and domains hosted on these servers will become inaccessible! Usually, problems like this can be solved by simply updating DNS software on the name servers hosting the tested domain. In rare cases, the problem may be caused by a too strict firewall that discards DNS queries with EDNS extensions. 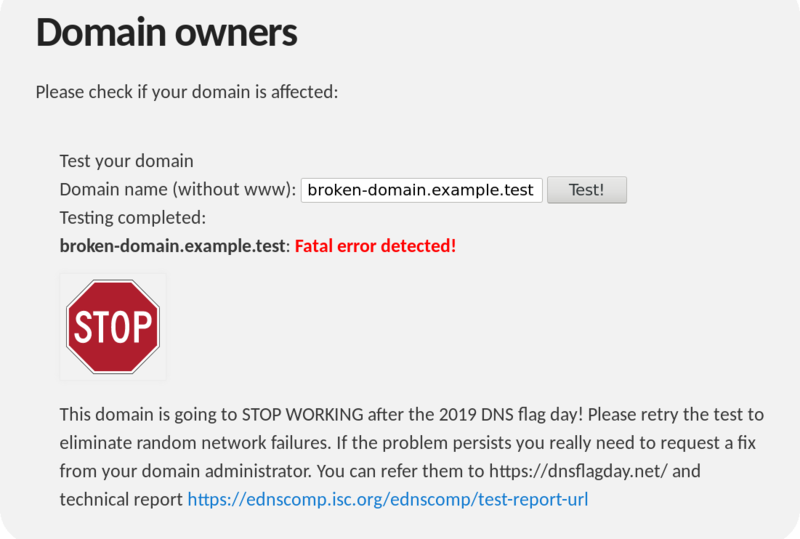 See dnsflagday.net for more information along with the test tool and troubleshooting recommendations. In conclusion, we would like to wish all operators of DNSSEC validators and authoritative servers a smooth update of their software and seamless transition into the next 30-year DNS era.